Anyone looking for a quality hosting would be compelled to buy SiteGround hosting and they are right to do so. But when signing up, most gets confused on which plan to take. Because web hosting is not something you will use up and throw away, it’s more like an investment. So you need to be sure which SiteGround hosting plan best suits your needs. 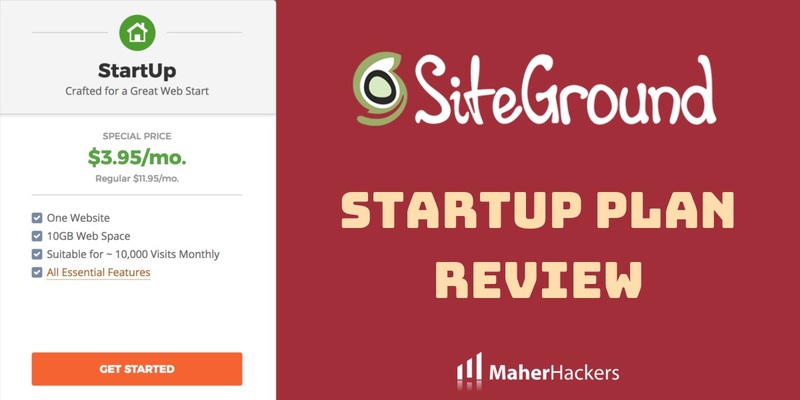 Here is the detailed SiteGround StartUp Review. By the end of this article, you’ll know if the StartUp plan is right for you or you need something bigger. The growing demands for high-quality web hosting services have encouraged many new companies to provide what the customers are seeking for. Though many big companies are already offering lucrative plans, many of their customers are not happy with the support and performance. That’s what offers companies like SiteGround a great opportunity to lure the unsatisfied clients and serve them to meet their unique requirements. SiteGround has quickly gained the reputation as a well-crafted and high-quality web hosting service provider within the last one and half decade. SiteGround Hosting was established during 2004. It is a Bulgaria based web hosting service which serves globally. Numerous website owners agree that SiteGround offers exceptional support as a web hosting service. Probably that’s why it had gained the top position during 2017 Facebook poll and 2016 Facebook poll conducted by WordPress Hosting Group. SiteGround offers 3 Shared hosting plans: StartUp, GrowBig, and GoGeek. Though the StartUp plan is quite amazing, GrowBig will be a better choice for you if you are seriously planning to grow bigger in the future. When you want to gain more features than common features offered with shared hosting plans, the Semi-Dedicated GoGeek plan offered by SiteGround will certainly impress you. There are many other important things that you would like to learn before you choose SiteGround to host your site. So, let’s check all the essential details in a comprehensive way. Before we go into SiteGround StartUp plan details, here are the features of the host we found to be worth mentioning after checking numerous SiteGround customer reviews. The users have explained many vital details that you must know before you spend any penny on a web hosting plan. You may like some features and some features may not seem satisfying. So, let’s explore what does make SiteGround the best choice for hosting your website and if the StartUp plan will fullfil your needs. SiteGround has satisfied the demands of numerous users till the date. After analyzing different platforms for reviews, It seems they all agree that it is the #1 web hosting platform. The plans offered by SiteGround are quite similar as Drupal, Joomla, and other CMS platforms. SiteGround as a web hosting service offers a powerful feature set. It will please them who are more technically biased. This host offers the daily backup facility that is quite essential when your regular backups fail. It offers you with industry standard cPanel to control your dedicated server and it comes with a user-friendly account backend. If you have a starter website, SiteGround will offer free domain name and free transfer for 12 months. It also offers a free website builder tool that you will need if planning to design the website by yourself. In addition, this web hosting platform offers multiple developer-oriented features. It is compatible with CloudFlare’s CDN. The GoGeek plan provides you with free Git and staging areas and free PCI compliance, which are quite useful when it comes to integration. SiteGround is not one of those web hosting platforms that claim to provide fast loading speed but fail to deliver. Whenever a user enters your website’s name in the address bar of his browser, the request of loading website goes directly to your hosting server. While doing this SiteGround StartUp review, we found that the server does not waste any second in processing that request. It quickly sends your website files to that user’s browser and your user experiences fast loading speed. SiteGround makes big claims about the site loading speed and website’s performance. Many users agree that it delivers what it claims. You are going to discuss many issues and confusing features with the customer executives when launching your first site. Your chosen web hosting service must provide satisfying customers service. Whether you have any technical knowledge or not, your host should be able to help you in resolving the issues affecting the performance of your website. When it comes to client satisfaction, SiteGround does not let anyone regret choosing its web hosting plans. It offers prompt support by diagnosing the issue quickly. We have discussed many important things about SiteGround web hosting in this SiteGround StartUp Review. The features endorse why you must consider this web hosting service first when planning to launch your personal or business website. Let’s check the plans and compare their features to recognize which one will satisfy all your needs and if the StartUp plan is the way to go. SiteGround StartUp plan along with all the web hosting plans offered by SiteGround comes with free hosting migration and email. It features core speed technology of SiteGround and promises up to 99.9% uptimes throughout the year. You get NGINX servers, Solid State Drives (SSD), HTTP/2, and PHP7 supporting servers. This platform always searches for new technologies and include them in order to improve your web hosting experience. With this particular plan you will have 1 daily backup, secure server, free Let’s Encrypt SSL, and spam prevention features. SiteGround constantly releases updates to make your site secure. Though you will not get priority support with the StartUp plan, still there will be no problem whenever you seek experts’ support to resolve technical issues. Choose the StartUp plan if you want to host one site per with features of Joomla, WordPress, and Drupal. The GrowBig package allows you to host numerous website with up to 1.5x more server resources in comparison to the StartUp package. Yes, you will get priority support with this plan. Paying only $2/month extra than StartUp plan is not a big deal when you are getting such amazing features. This package includes free wildcard SSL for 12 months and regular 30 backups. You get more database, storage, and email features than the StartUp plan. This package also offers sophisticated caching with “all 3 levels” along with the SG optimizer plugin. SiteGround’s GoGeek package is a special one because with this package you can host several sites on semi-dedicated hosting. You will experience 4-time better speed in comparison to lower shared hosting plans offered by many leading web hosting companies. You can design staging websites to assess new plugins, code, and designs, and then you can launch the official website with just one click. You will get much larger web storage, database limits, and emails with this package. This package is quite essential when it comes to preventing credit card frauds on e-commerce platforms because it is available with PCI compliance. You also get SG-GIT for repo creation. Its premium restoration and backup services help the user to request SiteGround’s customer support team bring back website’s original version if required. You seek already installed SG-Git or GIt for WordPress repo creation. SiteGround is earning a lot of admiration from its active users. Many new users are choosing this web hosting platform to launch their websites and run them smoothly. This SiteGround Startup Review explains all the available features of the StartUp package along with its comparison with the GrowBig and GoGeek packages. So, now it should be easier for you to pick a right web hosting package for your website. If you still have any confusion, Shoot me an email at vinod@maherhackers.com and I’ll help you out. Previous Post: HostGator Business Plan Review (2019): Read This Before Signing Up! Next Post: SiteGround GrowBig Review: Better than StartUp and GoGeek?